If wine is cultivated in an area where forest fires occur more often, such as in Australia or Southern Italy, aromas that make the alcoholic drink unpalatable can develop in the finished product. Until now, it wasn't known why this is so and what happens at the molecular level. A team at the Technical University of Munich (TUM) is now describing the reason why the smoke aromas are stored in the grapes and is thus showing the way for growers to eliminate this degradation in quality. 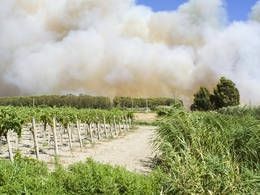 In the case of wine production, it is not initially clear whether there was a fire near the vineyard from which the grapes come. Only when opening a bottle of wine is a strong off-note perceived. "The smell and taste of such a wine is then often described with the term ash or ashtray," says scientist Katja Härtl. "This leads to a strong reduction in the quality of the wine." Those now thinking of barrique-produced wines, which taste "smokey" to some people, will learn from the scientist that it's not comparable to that. Yet what's happening in the fruit? A study got to the bottom of this smoky taste and is now described by Professor Wilfried Schwab and his team from the Professorship for the Biotechnology of Natural Products at the TUM in the Journal of Agricultural and Food Chemistry. Aromatic substances are volatile and in nature are attached to sugar, for example in plants. The aroma can be retained or stabilized with this sugary compound. The aromatic substance can then once again be detached from the sugar and released. This process is called glycosylation. It describes a series of chemical or enzymatic reactions, for example, in which carbohydrates are bound to small, hydrophobic compounds such as aromas. An enzyme called glycosyltransferase is responsible for this. If grape vines are exposed to bush fires, as happens more often in Australia, Southern Italy and California, the grape vine absorbs the smoky aromas via its leaves and fruits. In the plant, the off-notes are then linked with sugar molecules by a glycosyltransferase -- a protein that acts as a biocatalyst. This link with sugar molecules makes the smoky off-notes more water-soluble. As a result, the grape vine stores the now no longer volatile smoke aromas. But why does the glycosyltransferase process these foreign substances? The team led by Prof. Schwab has an explanation for this as well: "Actually, the job of glycosyltransferase is to process the resveratrol." Because resveratrol, a substance with a health promoting effect, is naturally contained in the grape vine and in terms of its structure resembles the smoky aroma molecules. As long as the grapes haven't been harvested yet, the stinking smoke molecules are bound and the ashy smell and taste can't be noticed. During fermentation, however, the wine yeast added by the fermentation process once again separates the sugar molecules and the smell develops. "Therefore, it only becomes apparent in the finished wine that the vineyard was exposed to a fire and the final product is of poor quality," first author Katja Härtl explains. Because the glycosyltransferase ensured that foreign aromas that are not desired by the customer were incorporated with the smoke molecules. "We now know how such a taste can develop," Prof. Wilfried Schwab says. "In the next step, we can try to cultivate either grape vines with less glycosyltransferase. Or we'll add a second sugar to prevent the release of the bad aromas." Alternatively, yeasts that are not capable of releasing the smoke aromas could also be used during fermentation. The gene responsible for this could also be removed, which, however, consumers here in this country tend to reject. The investigation of the molecular mechanism leading to the formation of undesirable aromas in wine is now allowing vintners to take various counter-measures to ensure the quality of the alcoholic beverage.